Showing 41 articles from March 25, 2015. 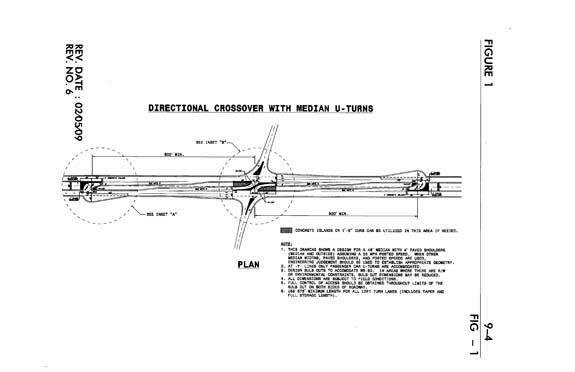 Right-of-way acquisition for Section C of U.S. 401 in Franklin County has begun, signaling the first public action on improving the aging two-lane highway in decades. A contractor with the North Carolina Department of Transportation has been contacting landowners along the highway corridor from the Franklin-Wake County line north to just north of the Royal crossroads. FRANKLINTON -- Town commissioners agreed to back a couple's plans to bolster the community and downtown development with a building reuse grant. Stan and LeaAnne Hahnel are proposing to turn the old Henderson Pharmacy building directly across from Franklinton Middle School into a store akin to a Goodwill. 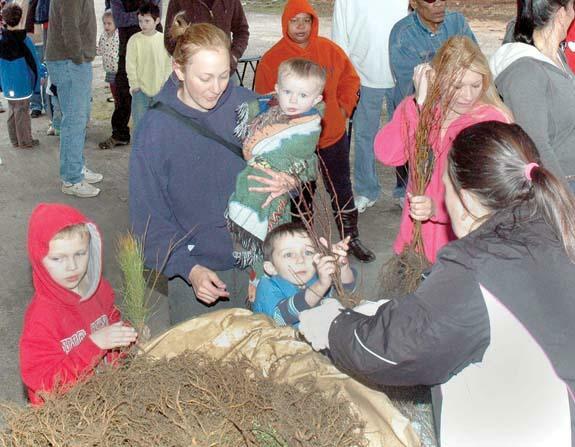 The Franklin County Cooperative Extension handed out hundreds of trees this past weekend as part of its annual tree giveaway program. Above, the Sheldon family, Nicole, with her sons, from left, Luke, Jacob, grabbing some saplings, and John, get some trees for their yard. LOUISBURG -- A vacant lot in the heart of town could become bustling again. Lowes Foods moved its grocery store out of the Wade Avenue location to Shannon Village in the spring of 2012, taking an anchor store out of the Wade Avenue shopping center. 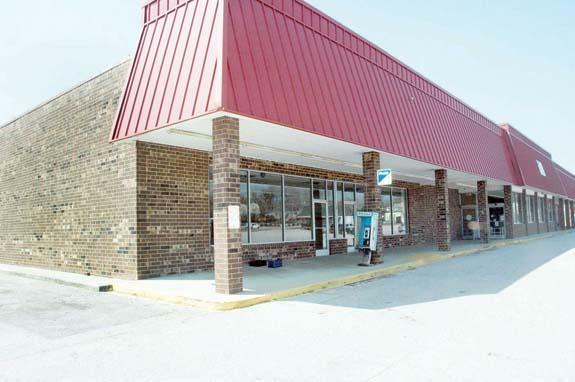 Earlier this month, though, JMD Housing LLC purchased the old Lowes Foods location with plans to revive the center. RALEIGH -- Louisburg High student Phoenix Spivey got a first-hand chance last week to see how the General Assembly operates. Rep. Bobbie Richardson recently sponsored the senior for the annual Youth Legislative Assembly, hosted by legislators. "I really enjoyed it," Spivey said of the three-day event. "I got to learn a lot. "Consider the source," was an admonition my school teacher mother used to voice all the time, usually meaning that you should consider who is making a comment as important as the actual comment. 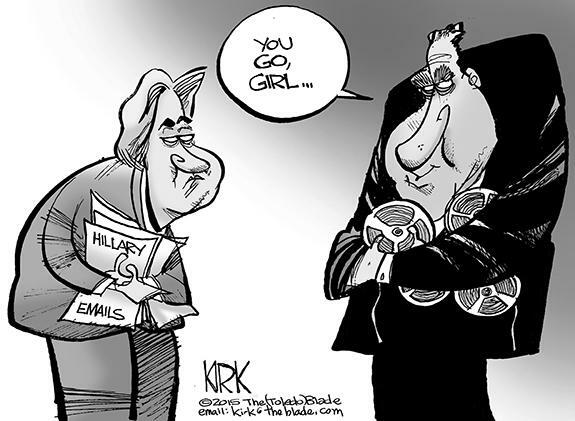 Nothing could be more accurate when you're considering what you're reading in the news media these days, either. The source -- actually, the perspective, historical knowledge and overall context -- means everything. Stories can be filled with facts -- yet be presented in such a way as to present the facts in an incomplete picture. Youngsville's idea is sound; can county hold up its end? The town of Youngsville has suggested an interesting partnership with the county of Franklin that makes sense -- but which has more "working parts" than it might appear at first glance. The proposal is simple. The town wants the county to tie its sewer allocations in the town's extra territorial jurisdiction to the understanding that the developer would petition the town for annexation. I read with particular interest this week that the Triangle will be getting the area's first treetop adventure course at the 236-acre Blue Jay Point County Park. The course, as it is being reported, was developed through a partnership with Wake County Parks and Recreation, a group called Open Space and the developer, Go Ape. "Political profit from religious bigotry." Those words were part of a eulogy that former Republican U.S. Senator, United Nations Ambassador and Episcopalian priest John Danforth gave at the memorial service for Tom Schweich. Schweich had served on Danforth's Senate and United Nations staffs. Schweich apparently committed suicide in reaction to a whisper campaign that he was Jewish, which he alleged was orchestrated by Missouri Republican Party Chairman John Hancock. I want to commend Sen. Chad Barefoot and other members in the legislature who are sponsoring a bill to not enforce wood stove regulations being implemented by the Environmental Protection Agency. Former Raleigh News & Observer editor Claude Sitton, who died March 10, embodied the noblest ideals of the journalism profession. As editor of the N&O from 1970 to 1990, Sitton assembled a first-rate staff and won a Pulitzer Prize for commentary in 1983. LEXINGTON, NC - Florina McGuire Edwards, age 79, of East Old Highway 64, Lexington passed away Sunday night (March 22, 2015) at Wake Forest Baptist Medical Center. I'LL RACE YA. (L to R) South Granville's Carli Austin and Bunn's Jessica Perez try to track down a loose ball during Tuesday afternoon's Northern Carolina Conference girls soccer showdown on the BHS campus. SG was a 6-2 winner. 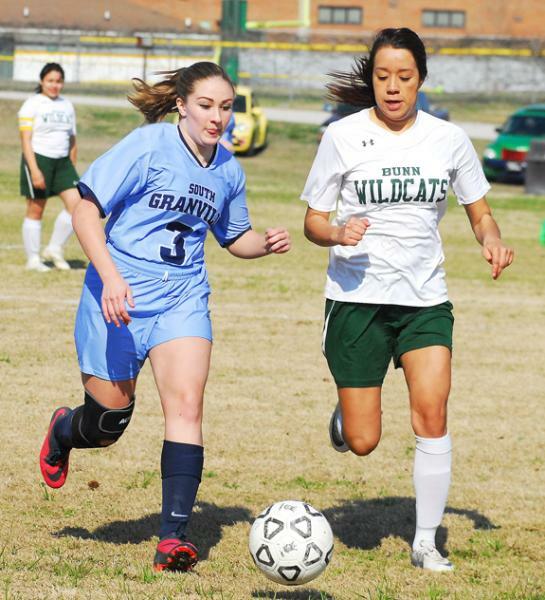 BUNN - With three players unavailable due to injury or other factors, the Bunn Ladycats were shortfooted heading into Tuesday's Northern Carolina Conference girls soccer showdown against South Granville. One of those injured performers is junior midfield standout Haley Jones, who might not return to the lineup until after Spring Break. PROVIDING A BIG LIFT. Bunn's Erica Davis sends a fly ball skyward during Tuesday evening's home softball decision over South Granville. Davis was strong at the plate and was also the winning pitcher for the Ladycats. 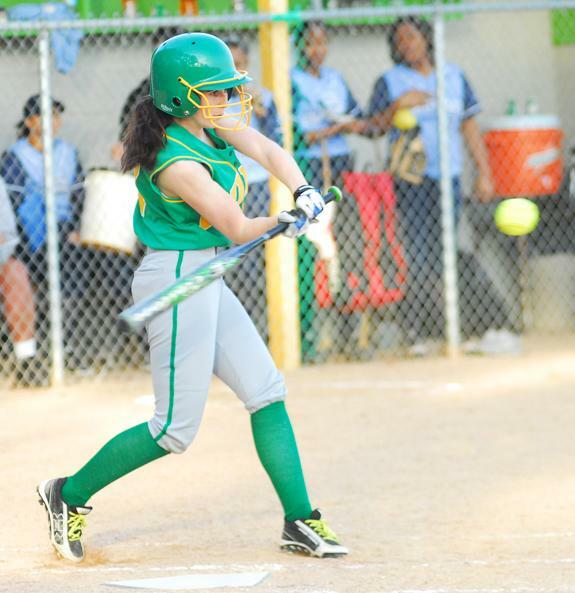 BUNN -- It took Bunn almost 20 years to finally secure a fast-pitch softball victory against long-time powerhouse South Granville last spring. 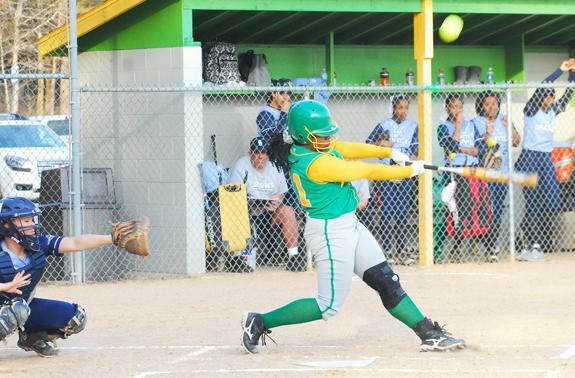 Now, the Ladycats are on a two-game winning streak versus the Vikings following Tuesday's 5-4, nine-inning thriller in a Northern Carolina Conference showdown on the BHS campus. JUST ROLLING ALONG. 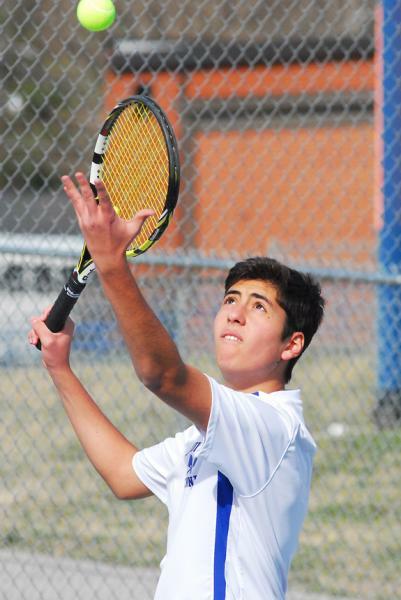 Pedro Barreto and the Louisburg HS Warriors are undefeated so far this spring in boys tennis action. LOUISBURG -- Louisburg's best start in recent boys tennis memory added a first Tuesday afternoon. LHS was able to secure its initial team victory over Franklin Academy during the Coach Johnathan Waugh Era by a 6-3 margin on the road. "This was certainly the biggest win we've had here at Louisburg since I've been here,'' Waugh said. 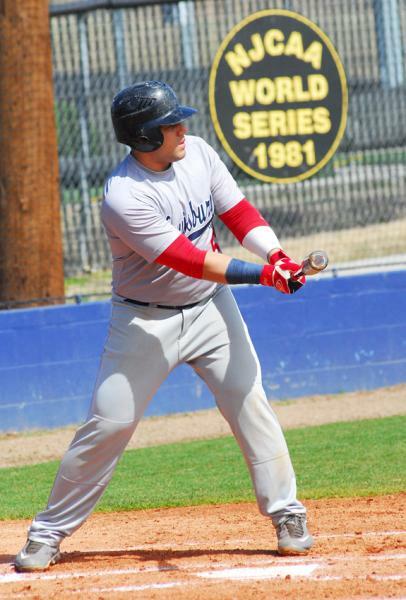 LOUISBURG -- Louisburg College picked up one victory as part of its four-game home baseball series last weekend against Region X rival Pitt Community College at Frazier Field on the LC campus. Louisburg is now 3-16 overall to go with an uncharacteristic 1-11 mark in league action. For LC, the highlight last weekend game in Sunday's opener as the Hurricanes rode a strong pitching performance from Jeremy Swan to secure a 5-1 triumph over the Bulldogs. SHOT SUCCESS. 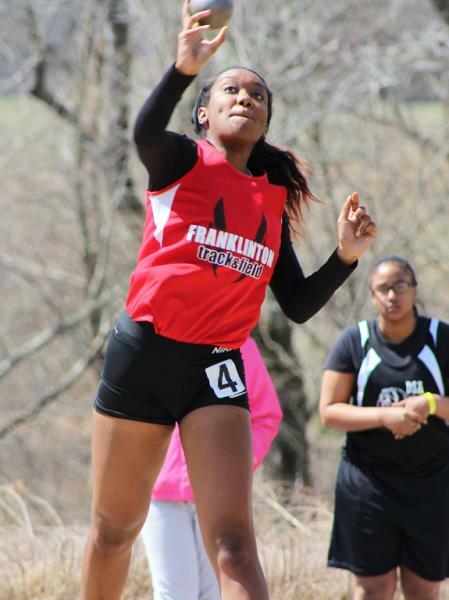 Franklinton's Michaela Greene delivers the shot put as part of last Saturday's action at the T. Sanders Memorial Invitational Track and Field Meet at Franklinton High School. FRANKLINTON -- When popular, long-time Franklinton High School track and field coach Trent Sanders passed away unexpectedly last fall, it didn't take his friends and family members long to determine the best way to honor his legacy at FHS. Plans were formulated for the T. Sanders Memorial High School Invitational -- an event that was staged last Saturday at the FHS Football Field. BUNN -- The Bunn Wildcats boys baseball team defeated the Franklinton Red Rams 1-0 on Saturday afternoon at Bunn High School field. Wildcats' catcher Josh Boone batted in the only run of the game in the bottom of the fourth inning. ZEBULON -- The Carolina Mudcats, the Class A Advanced affiliate of the Atlanta Braves and member of the historic Carolina League, have announced their promotional schedule for the 2015, 25th anniversary season at Five County Stadium. Individual tickets are now available online at www.caronlinamudcats.com, by calling (919) 269-2287 and by visiting the Five County Stadium box office. NASH COUNTY -- The North Carolina Wildlife Resources Commission will open the statewide spring hunting season for wild turkeys -- male and bearded turkeys only -- on April 11 through May 9, preceded by a youth-only week from April 4-10. During the youth-only season, turkey hunting is only allowed for those younger than 16 years, who must be accompanied by a licensed adult at least 21 years old. Bunn's Jessica Szkola rips a single during Tuesday evening's home softball triumph against conference rival South Granville HS. 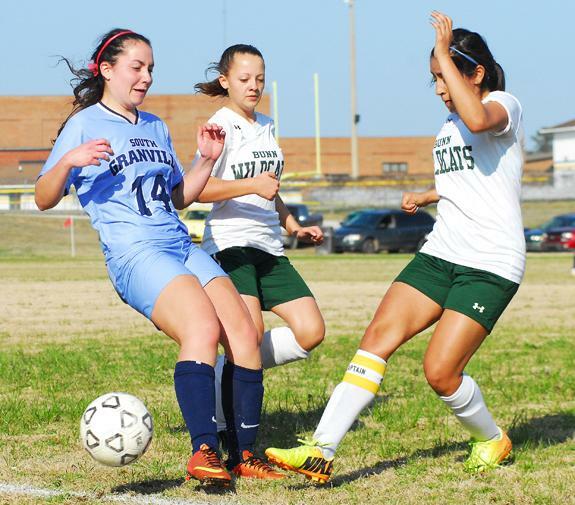 South Granville's Jenny Sab (left) is double-teamed by Bunn's Mariah Campbell (middle) and Lineh Martinez (right) during Tuesday's conference girls soccer match. The national Presbyterian Church supported the development of churches and schools in Louisburg and Franklinton after the Civil War. Through the efforts of local citizens and missionaries from elsewhere, this denomination planted seeds that continue to bear fruit today. John and Teresa Williford of Oxford announce the engagement of their daughter, Kristen Brooke Williford to Travis Madison Jones. The prospective groom is the son of Renee Autry Jones of Franklinton and Darryl Jones of Creedmoor. 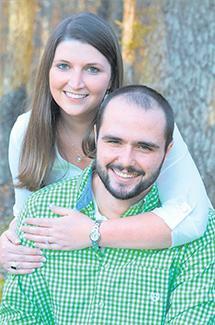 A wedding is planned for June 27, 2015 at Sharon Baptist Church in Oxford. Kerr Vance Academy recently announced their third quarter honor roll. 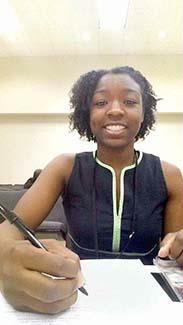 David Carey Denton of Louisburg has accepted membership in The National Society of Collegiate Scholars (NSCS). "NCSC is more than just a symbol of academic achievement. Membership gives students access to a number of amazing benefits including career and networking resources, scholarships, travel, and service projects both on campus and in the community," said Stephen E. Loflin, NSCS founder and chief executive officer. A veteran Franklin County educator is retiring at the end of June. Novella Brown, currently principal of the Creative Education Center and formerly the long-time principal of Terrell Lane Middle School, told the school board in March that she is retiring. The school board voted to accept her retirement resignation. 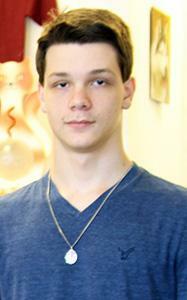 HENDERSON -- Robert Chafee will be inducted into the Alpha Sigma Chi Chapter of Phi Theta Kappa at Vance-Granville Community College. Chafee, from Youngsville, majoring in Legal Services/Paralegal, is the son of John Eisler and Joyce Equils of Youngsville, and is married to Tamara Chafee of Louisburg. 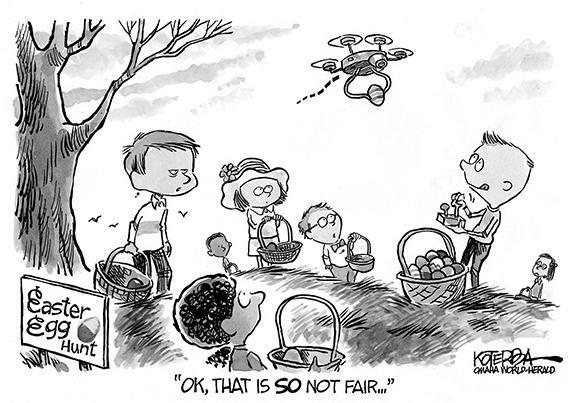 Searching for the perfect Easter Egg! SPRINGING UP. 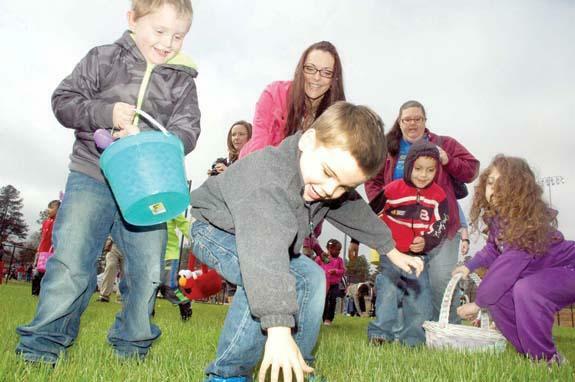 Trenton Hotte, foreground, with his mother, Sarah, background, races for Easter Eggs during the Franklin County Easter Egg Hunt last Saturday at Franklinton Park. 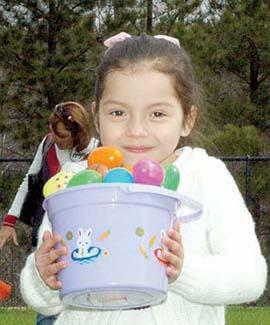 Friends of the Youngsville Library will host an Easter Egg hunt at the Youngsville Library this Saturday, from 1-3 p.m., rain or shine. HENDERSON -- The stage is set for the 61st Jabberwock Scholarship Program sponsored by the Oxford-Henderson Alumnae Chapter of Delta Sigma Theta Sorority, Inc. It will take place at 7 p.m. March 28 at Vance-Granville Community College Civic Center. Guest emcee will be Valonda Calloway of WNCN. YOUNGSVILLE -- The CenturyLink Community Relations Team is hosting a Community Yard Sale with proceeds benefitting the Franklin County Relay for Life. The April 25 event is scheduled from 7 a.m. to noon in the company parking lot at 14111 Capital Boulevard. Bobby Shatterly, area plant supervisor and volunteer chairman for the CenturyLink Relay for Life team, is enthusiastic about this event. BUNN -- Town commissioners decided they needed at least an extra day to continue whittling down their choices for a new police chief. The board met in special sessions on March 20 and again on March 24 to discuss candidates for the town's top law enforcement position but have yet to come to a conclusion. FRANKLINTON -- Police arrested a 31-year-old man this past weekend in an apparent alcohol-fueled shooting over the weekend. According to authorities, Kenny McGhee approached the intersection of Cheatham and Mason streets in a vehicle, telling officers he had just been shot in the leg. An Edward Best Elementary second-grader wanted to make this past Christmas a bit brighter for folks. 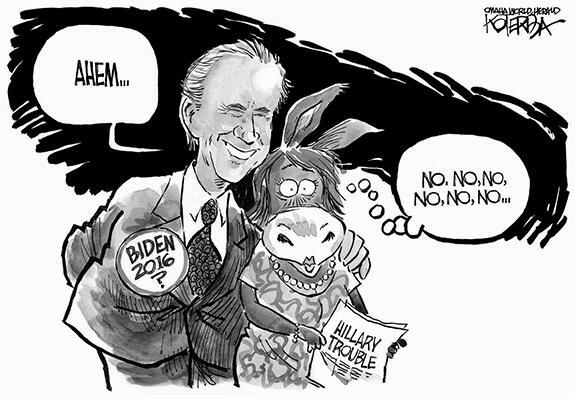 She recruited some help, too. Right, Lindsey Lundy is pictured with Susan Miller of Franklin County Social Services after having donated 10 boxes of toys. 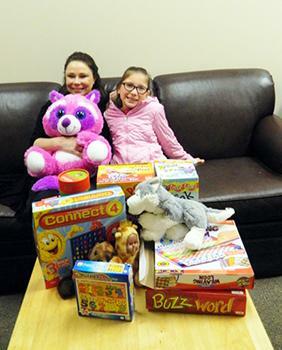 Lindsey decided to donate some of her used toys to others for Christmas and decided that Social Services would be a good resource to make sure the items got to good home. FRANKLINTON -- Firefighters responded to one of the county's largest industries Wednesday, but it turns out there was no danger to person or property. Firefighters responded to Novozymes on Perrys Chapel Road at about lunch time where there was smoke coming from a production area, Novozymes staff said. 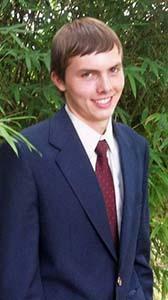 Duncan Younger from Bunn has earned the highest rank of Eagle Scout with the Boy Scouts of America. He was awarded the rank in October 2014. His ceremony will be held at Louisburg United Methodist Church on April 26 at 2 p.m.
Duncan is a member of Troop 555 in Louisburg and has been in scouting for more than 10 years. He planned and completed his Eagle Scout project by designing, building and donating raised dog beds to the SPCA of Franklin County Pet Pantry.